All GVCC members can meet with the Communications Director for a one-hour PR consult. This session includes learning about all the media outlets available for earned media in Southwest Washington. A Brainstorming session on your business and how to align messages that the media will want to cover as a potential story; plus go over AP guidelines for press release creation and industry standards when communicating with your local media outlets and reporters. 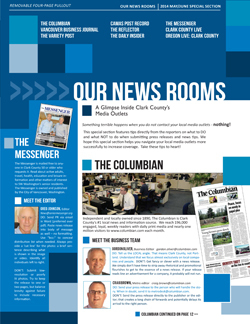 Click Here to download the 'Our Newsrooms' special section from the March/April Vancouver VISION Magazine.